Two men were still being questioned by police last night as part of a murder investigation following the death of a 29-year-old man. 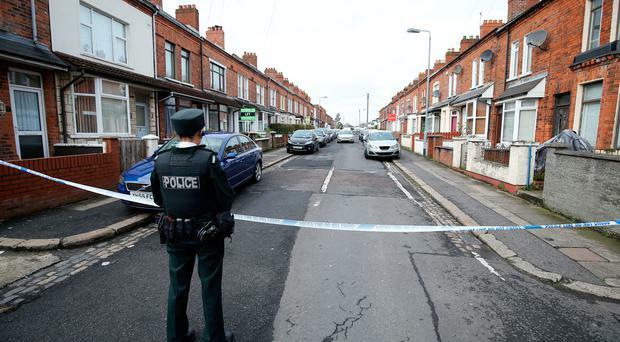 Police said they received a report that a man had been injured in a house on Titania Street, just off the Cregagh Road in east Belfast, shortly after midnight on Sunday morning. The Northern Ireland Ambulance Service said the man was treated at the scene by paramedics before being rushed to the Royal Victoria Hospital, where he died from his injuries a short time later. Police confirmed that two males, aged in their 30s, were arrested on suspicion of murder and were taken to Musgrave PSNI Station for questioning. Cordons were erected at both ends of the short street yesterday as forensic investigations continued. Hours earlier, residents had awoken with shock to the news of a murder on their doorsteps. A yellow evidence bag could be seen at the entrance to the terrace property close to Cregagh Methodist Church while the front windows were also covered up. Around the corner at the Co-op supermarket, a worker said he had been returning home from a night out when he came upon the scene of the incident. "There were police cars and an ambulance but the whole street was sealed off," he said. "It was really shocking." Staff at the nearby Bethany Fish and Chip shop were also stunned by the man's death. "It's scary that this sort of thing has happened only up the street," one woman said. East Belfast Ulster Unionist councillor Sonia Copeland expressed her shock at the news as she visited the area yesterday. She said: "This is a dreadful event to happen in what is a quiet residential area and I would like to express my sympathy to this young man's family. "It's appalling that in this day and age we still have this sort of thing happening within our society. "It does worry me slightly that violent crime is becoming more prevalent now in this area." Alliance councillor Michael Long said people in the community had been left shocked. "Any death in suspicious circumstances is traumatic but the loss of a young man's life is even more distressing," he commented. "My thoughts go out to the loved ones of the victim." Detective Superintendent Jason Murphy from the PSNI's Serious Crime Branch has appealed for anyone who was in the Titania Street area late on Saturday night or early on Sunday morning and who witnessed anything to contact detectives at Musgrave Police Station on 101 or Crimestoppers on 0800 555 111.